“And thereupon we are entered the cave. It was a large, airy place, with a little spring and a pool of clear water, overhung with ferns. The floor was sand.” This is how Robert Louis Stevenson described this site in his publicly acclaimed book, Treasure Island. 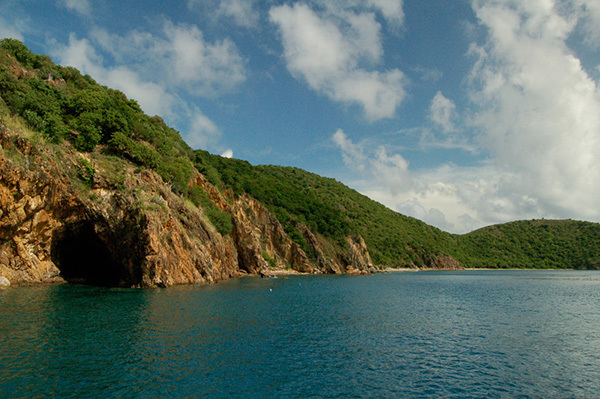 The Caves can be found on Norman Island, on the western edge of The Bight and it’s one of the most popular diving sites in the British Virgin Islands. It consists of three caves, all populated with schools of colorful fish. The walls of the caves are patchworked with red sponge and orange cup coral; yellowtail snapper, puffer fish, trunkfish, parrotfish, sergeant majors ,fryfish, damselfish , squids, lobsters, sea cucumbers, blue tangs and barracudas. The first cave will captivate you the second you go inside, you will have an incredible view ahead of you but make sure you watch out for sea urchins. When you go to the second cave you will notice the water is not as deep and has bigger schools of fish. The last cave is perhaps the most captivating one, colorful fish, swimming in big schools, will enchant you. If you go deeper in the caves it will be pretty dark and scary so bring a flashlight with you if you’re afraid of dark areas; you won’t have any trouble finding your way or the marine life around you, so this isn’t mandatory. You will have lots of fun while exploring the depths of The Caves, snorkeling in the dark, feeling like a veritable pirate going to his first treasure hunt!